All children are encouraged to have a water bottle in school. It can be used in any lesson or activity as long as it contains water only. Water bottles can be refilled at our water fountains; Bowsland Green water bottles are for sale in the office at £1.50 each. Children may have a school dinner, bring a packed lunch or go home for lunch. We hold the Healthy Schools Award and our meals are well balanced and nutritious. The cost of dinners is currently £2.10 per day (£2.20 from 1st September 2018) for KS2 children. All pupils in Reception and KS1 qualify for a universal ‘free hot lunch’ under the Government initiative scheme. If you think your child/ren are entitled to Free School Meals, please call at the office for more information. Dinner money owed for pupils in KS2 is paid on line, in advance using our parent payment system SIMS Agora. These should be in a container clearly marked with name and class. There should be no sweets, chocolate bars or fizzy drinks. 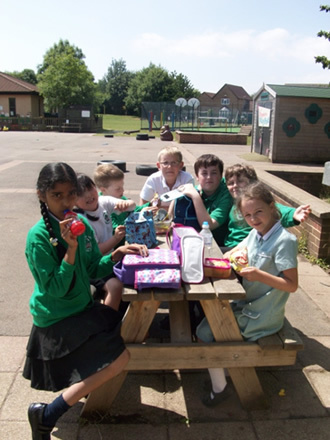 We are a Healthy School and encourage the children to eat as healthily as possible. Only squash, juice or water are allowed for lunch. Children going home for lunch must be collected from school at the end of morning lessons (12am) and should not return until 1pm promptly. A piece of fruit is given daily to all Reception, Year 1 and Year 2 children; this is free as it is from the government’s ‘5-a – day’ scheme. Children may bring fruit only during morning break. Toast is for sale at break time costing 10p per slice. Milk is provided free to children under 5 years of age for their consumption during the morning. Parents can buy milk for their older child through the Milk Board scheme which is administered by the School Milk Services Ltd. For further details please collect a form from the office or ring School Milk Service on 01934 510950.